This document is available in print and alternate formats upon request. Please call 204-785-4900 or submit a CitizenSupport ticket using the category “Accessibility”. These programs and services are located at a variety of buildings and public facilities. Municipal Civic Office existing building accessibility, includes automatic door access, street access to building which has a gradient slope to the street, an adjacent parking lot for ease of access; wheelchair access to washrooms, light switches at lower height, wide halls, wide office doors, Council Chambers at ground level. Culture Recreation and Green Transportation existing building accessibility includes automatic door access, wheelchair access to the building, light switches at lower height, wide halls, wide office doors. Recreation complex has wheelchair access to the ground level of the complex; the banquet hall has access on ground level, and the main entrance has ramps into the main lobby and concourse level. Curling Rink, Selkirk Arena and Memorial Hall have ramp access into buildings. Gaynor Family Regional Library open in 2014 had accessibility features incorporated in the construction design. City Sidewalk Replacement Schedule includes wheelchair accessibility installed when repairs or replacement to existing sidewalks are made. All new sidewalks are constructed with wheelchair accessibility. New Fire hall construction design to incorporate accessibility features into the building. Public transportation includes a paratransit bus service. Local taxi service provides handivan service. Municipal Elections held in accessible locations in 2014. Specific crosswalks have audible notice for pedestrians. Community information Blue Book is accessible on line and hard copies available in various public locations. City website is currently being re-designed and as it is being developed we research and strive to include accessibility features. Working towards website and content to conform with WCAG 2.0 (Web Content Accessibility Guidelines), which syncs with Canada Standard on Web Accessibility. Incorporating detectable warning strips in high traffic areas of new sidewalk installs. Vehicle Parking with disability vehicle identification on streets is at double time for any time restriction on street locations, ie 1, 2 & 3 hour time to 2, 4, & 6 hours. Council email addresses are accessible via the website. Council adopted Recreation Master Strategy 2016 which includes accessibility. Public Events – Public Hearings, Council meetings held at Municipal Civic Office which is accessible. Public Consultation events held at accessible locations. Staff awareness and training to recognize and respond to an accessibility barrier. Assessment of programs, services and public facilities to determine barriers that prevent customers receiving service. Front reception desks design not accessible for wheelchairs.Operations Department front entrance design. Alternative communication tools to accommodate those attending meetings; and accessing our website who may have accessibility issues. 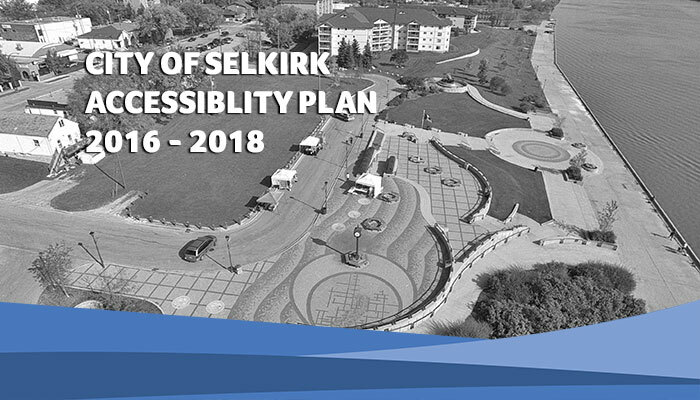 The City of Selkirk will strive to provide equitable treatment and benefits of City services, programs and facilities in a manner that respects the dignity and independence of people with disabilities, including physical, mental, intellectual or sensory impairments which may hinder their participation. The City of Selkirk to review its existing programs and services; public facilities and new initiatives with the goal to remove or prevent accessibility barriers. City of Selkirk will make information available in an accessible format or provide communication supports to people with disabilities in a way that considers their disability. ATTITUDINAL BARRIERS – may result in people with disabilities being treated differently than people without disabilities (e.g., talking to an individual’s support person assuming the individual with a disability will not be able to understand; assuming a person who has a speech impairment or speaks a different language cannot understand you; thinking a person with an intellectual or mental health disability cannot make decisions, etc.). INFORMATIONAL AND COMMUNICATION BARRIERS – arise when a person with a disability cannot easily receive and /or understand information available to others (e.g., print is too small to be read by a person with impaired vision; public address systems alert only people who can hear, etc.). TECHNOLOGICAL BARRIERS – occur when technology, or the way it is used, is not accessible (e.g., websites not accessible to people who are blind and use screen reader software; accepting only online registration forms for programs, etc.). SYSTEMIC BARRIERS – are policies, practices or procedures that result in some people receiving unequal access or being excluded (e.g., not considering the needs of persons with disabilities at the event planning stage; not being aware of policies that support accessibility, etc.). PHYSICAL AND ARCHITECTURAL BARRIERS – in the environment prevent physical access for people with disabilities (e.g ., a door knob cannot be turned by a person with limited mobility or strength; aisles are narrowed by displays or equipment making them impassable by a person using a wheelchair or walker, etc.). Initial consultation with Age Friendly Committee, comprised of representatives from stakeholder organizations – Gordon Howard Senior Centre, City of Selkirk Councillor, Selkirk Transit, Kiwanis on the Red Housing, Tudor House Nursing Home, Army, Navy and Air Force, Interlake-Eastman Regional Health Authority, Royal Canadian Legion Selkirk, Selkirk Friendship Centre, citizens at large; and representative from the Society for Manitobans with Disabilities; and staff members within the City of Selkirk departments. Future consultation with stakeholders including persons with disabilities to be part of plan review process. Draft a barrier free policy(ies) to be approved to allow people with service animals, communication, assistive devices such as wheelchairs, walkers, oxygen tanks, and support persons; barrier free access to goods and services; how the public will be informed when there are temporary barriers to buildings, spaces or services; employee training on how to service people disabled by barriers. The City of Selkirk will continue to strive to provide equitable treatment and benefits of City services, programs and facilities in a manner that respects the dignity and independence of people with disabilities, including physical, mental, intellectual or sensory impairments which may hinder their participation. Accessibility Plan posted on website and available in alternate formats. Current City staff to have received training and the tools to enable staff to readily respond to an accessibility barrier. Current City staff are able to recognize accessibility barriers and be empowered by policies to act to remove accessibility barriers. An assessment of City programs, services and public facilities will determine barriers that prevent customers receiving service. Alternative communication tools will continue to be investigated and used to accommodate those attending meetings; and accessing our website, who may have accessibility issues. Software and process enhancements that will allow City staff to enhance front line services and communications to the public, subject to annual budget and human resources. A barrier free policy(ies) to be approved to allow people with service animals, communication, assistive devices such as wheelchairs, walkers, oxygen tanks, and support persons; barrier free access to goods and services; how the public will be informed when there are temporary barriers to buildings, spaces or services; employee training on how to service people disabled by barriers. A database of barriers that prevent customers receiving service of existing programs, services and public facilities will be completed and used in future decision making. Tools, policies and practices respecting barrier-free access to comply with the Accessibility of Manitoba Act Regulations. A procedure to incorporate accessibility into the internal review processes for Administration when considering changes to existing and providing new programs, services and public facilities.